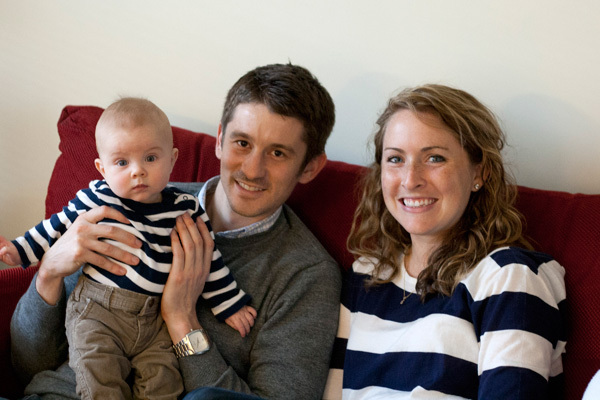 Our friends, Mike and Kayley, visited earlier this month. They live in Arlington, Virginia, and so a trip to middle-of-nowhere Pennsylvania was certainly a change of pace. But Nick and I proved that although we may live closer to cow pastures than to a Crate and Barrel, and we may be parents to an almost-six-month-old baby boy, we can still party. Yes, we consumed all 16 of these beers. 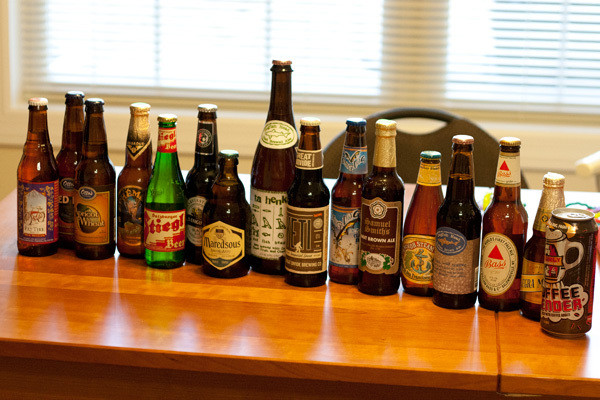 We tasted lagers and ales and stouts from around the world and discussed the merits of beer over wine, thanks to talking points from one of Nick’s idols, Sam Calagione. Clear favorites of the bunch included Apricot Wheat from our favorite local pub, Calagione’s Ta Henket, and our own homebrewed Pumpkin Ale. Nick and I typically prefer waffles of the sweet variety (i.e. pumpkin pecan waffles), but when I saw this recipe on Annie’s Eats, I knew we had to give it a try. The waffle batter includes yellow cornmeal, buttermilk, chives, parsley, and freshly ground black pepper. 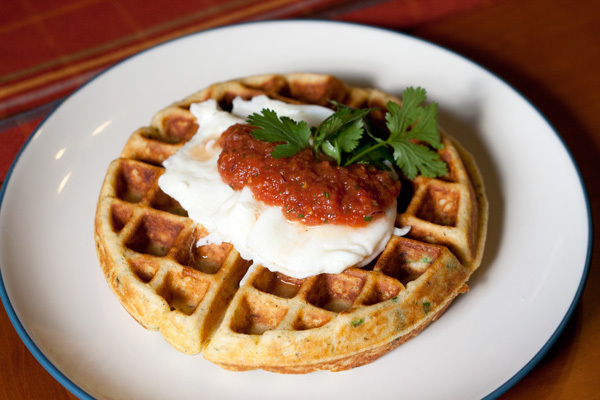 The waffles are crispy and flavorful and are even better when topped with eggs and salsa. 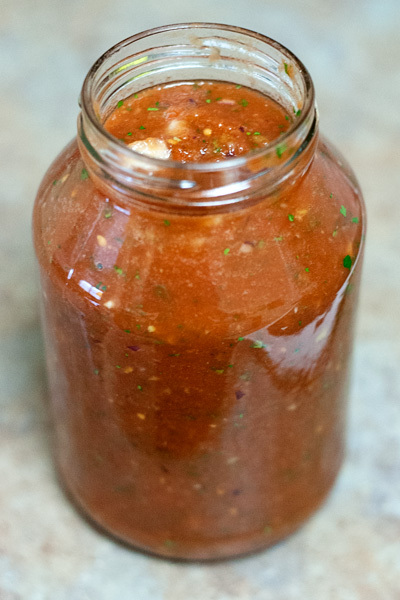 We decided this dish was just too festive for a jar of store bought salsa, so I whipped up a batch of our favorite version from The Pioneer Woman. Waffles without a pool of sweet syrup? Or a pile of berries and a hefty sprinkling of powdered sugar? We were skeptical. But the first bite of our “Fiesta Waffles” was surprisingly delicious — even better than we anticipated. We may just be savory waffles converts. 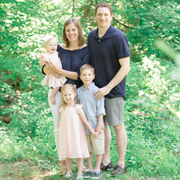 And to Mike and Kayley: We’re happy to host/cook for you both anytime! In a large bowl, combine flour, cornmeal, baking powder, sugar, baking soda, salt, and pepper. Whisk to blend. In another bowl, combine butter, eggs, and buttermilk. Whisk to blend. Stir in the chives and parsley. Add the wet ingredients to the bowl with the dry ingredients and whisk just until evenly incorporated; do not over-mix. 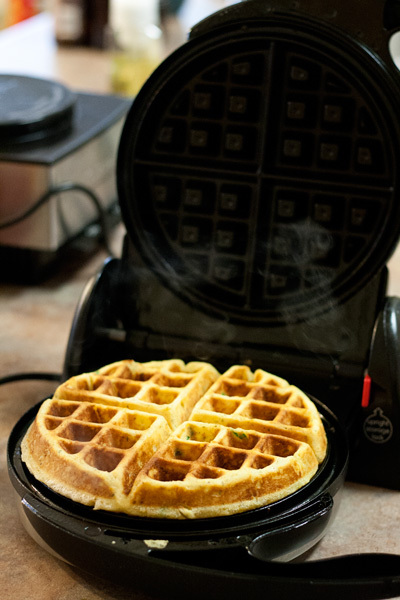 Cook the batter in a pre-heated waffle maker according to the manufacturer’s instructions. 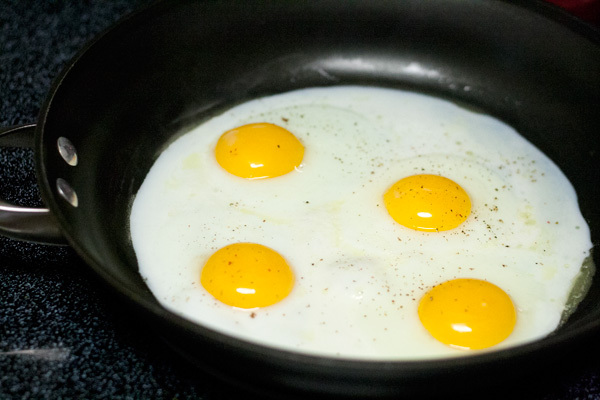 While the waffles are cooking, fry eggs in a non-stick frying pan. Serve warm waffles topped with salsa, eggs, and fresh chives. Season with salt and pepper to taste. Combine all ingredients in a large blender or 12-cup food processor. Pulse until salsa reaches desired consistency. Those waffles look yummy…but I can’t get over the beer spread!! What a variety! So creative! I never would have thought of a savory waffle. Looks like an amazing weekend!